We highly recommend your training services to anyone who is truly interested in enhancing their relationship with their dog. You are great to work with! Your knowledge and patience has helped us to build the confidence we needed for success. 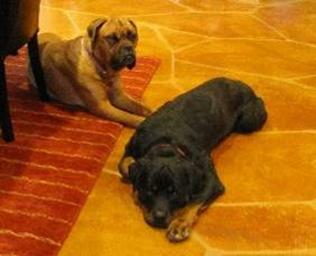 Since we started training with you, Thunder and Kota are more relaxed and comfortable around people and other animals. We are now able to take them to public places without fear of embarrassment. It feels so good to have strangers comment on how “well behaved” and “controlled” they are. Through your guidance, we know our bond with our best friends will continue to grow stronger. Thank you very much. My husband and I starred at each other across the table. We were in agreement that we had three options. Our first option was to pack up our belongings and move to a rural area with no neighbors and build a stockade fence to ensure limited human contact. Our second selection was to contact my mother, who conveniently lived in a rural area with no neighbors, and beg her to take our problem. The final choice was to continue hiding our dog from all of humanity for fear that she would be euthanized and we would be exposed as the failures that we were. To some, our plight may seem overly dramatic. For us it was all too real. 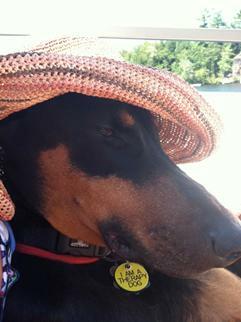 While I can’t recall when it went from bad to worse, there was no doubt that our Doberman Pinscher was out of control. We calculated that in the past ten months we had spent over $2,000 on dog training and a canine behaviorist. Our closets were stocked with long leashes, short leashes, harnesses, a weird head halter thing, a box that clicked, various gourmet dog treats and even a muzzle. Yet, the only thing I had to show for my collection of canine training apparatus was a dog that was so unpredictable we avoided taking her into public. At the advice of a trainer we tried to find an outlet for her “nervous” energy. We arrived at the agility field with high hopes and pockets full of roast beef. Before long we were chasing her around with a spray bottle full of water and a loud horn that the agility instructor explained would teach her not to act aggressively toward the other dogs. When she lunged at a small child with a golden retriever that was as old a fossil, my husband and I quietly walked off of the field and took her home. We knew that someone was going to get hurt. No roast beef or squirt bottle would prevent her behavior. We accepted that we just were not trying hard enough and that we could never measure up to the instructions of our behaviorist, who later scolded us for squirting water at our dog. She explained that positive reinforcement training was the only way to humanely train our dog. Furthermore, our “aggressive” actions were making our dog’s behavior worse. We just couldn’t keep her in line. We felt like terrible dog owners, and on some levels we were. During our daily walks, our trainer directed me to tie my dog to a light post or telephone pole when a strange dog came near. That way when our dog turned into the spawn of hell with hair standing up straight and foam dripping from her snarling teeth I knew she couldn’t get away from me. I was to distract her with food so that in time she would understand that when strange dogs came near, good things happened. Roast beef happened. For a few days I agonized over walking her. Each day the walk ended in a disaster of horrified joggers, other dog walkers passing us in terror, and my dog dining on lots of roast beef. The more I thought about the scenario the more uncomfortable I became. When I was a girl I had a grumpy pony that liked to buck. When we went to take a test ride before we bought her the owner wouldn’t let me mount. He was certain I’d get hurt and explained she had thrown his granddaughter every time she had ridden the mare. My mother bought the pony on the spot. I was scared to death and was sure my mother had lost all rational thought process. Mom explained that the man had soured the pony. Each time she threw her rider the rider didn’t get back on. Instead the mare was always brought back to the barn and given hay and grain. The pony learned that propelling her rider meant a clean stall and ample food. It was right about then I knew my dog was sour. What I didn’t know was how to fix it. I told you that story so that I could tell you this story. Our serenity came in the form of a mere mortal with raven black hair and nerves of steel. When we first met Julia, I showed her all of our failed training aids, told her of our failures, and admitted that we had lost hope. Julia smiled, fit my dog with a shiny metal collar, and calmly began to walk her around the room. In only a few minutes our unpredictable dog was marching confidently around the room in near perfect heel position. Soon another dog was brought into the room by an assistant and with no hesitation our dog was up to her old tricks. Julia gave her a swift tug and continued to walk around the room as though it were just she and my Doberman. Julia explained that the firm tug she had given a correction. If dog owners never correct their dogs, life will correct them. 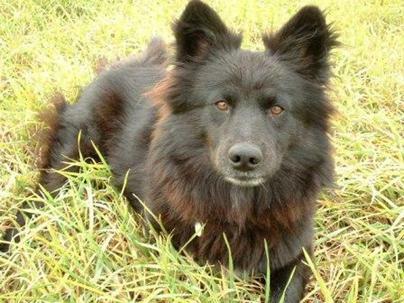 The disobedient dog that runs into traffic and is killed by a passing car is corrected. The dog that bites a child’s out stretched hand, who then is euthanized, is corrected. Julia would teach us that by only praising good behavior and not correcting bad behavior, our dog would never really understand what is expected of her. It was our responsibility to teach her what behavior is allowed and to inform her when the line has been crossed. It has been nearly two years since that first day we met Julia. Our dog has earned a Canine Good Citizen, attends dog daycare, and vacations with us. She has ridden on trains, ski lifts, and stayed in countless hotels. People remark at her good behavior. We’ve learned what situations are stressful for her and know how to handle our dog’s persona when those situations arise. Julia exceeded our expectations and provided hope and encouragement. Most importantly, Julia provided a level of guidance and professionalism when others in her industry where ill-equipped and fearful to even handle my dog. To say that Julia gave us our life back is an under statement. When I think back to the time when we were actually considering getting rid of our dog it makes me terribly sad. 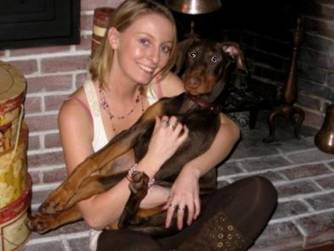 My Doberman is a terrific, once in a lifetime, wonderful pet. She just needed some sound handling and basic manners to bring that out. By putting away our devices that only manage poor behavior, learning to correct bad behavior, and actually training our Doberman we have a dog that we are proud to take out in public. We thought nothing could help us, luckily we were wrong. 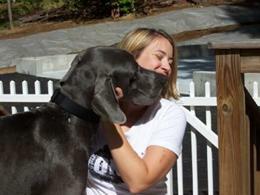 If you are serious about improving your dog's behavior, I urge you to train with Julia McDonough. 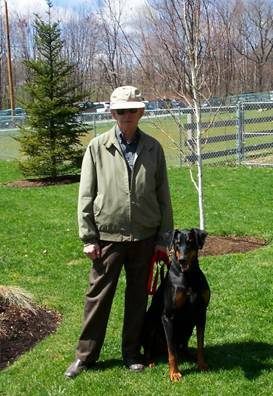 A number of years ago after adopting a large (110lb) 9 month old male Doberman we discovered his behavior was erratic and could escalate rapidly. Julia's calm, common sense, humane, methodical and highly effective training approach and methods turned our beloved big boy into an obedient companion and even more valued member of our household. 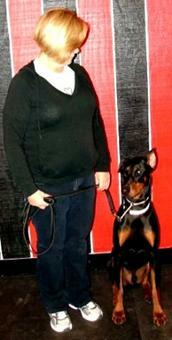 More recently, Julia also helped train our smaller, "soft" but headstrong, female Doberman. Julia is no training “Johnny One Note”. 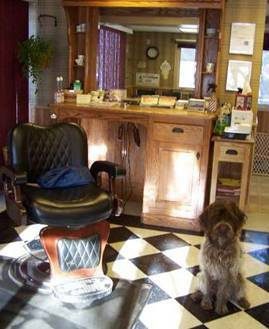 She consistently works miracles with large and small dogs of all temperaments and breeds. Not only will you be pleased with the training results, but you will learn a great deal from Julia, and you will not find a better person, or more effective trainer anywhere. We own an adopted Giant Schnauzer who developed the self destructive behavior of digging in his crate when left alone until his paws were bloody. We made matters worse by following Veterinary behavioral advice to medicate Leroy with Clomicalm and to never leave him alone again if the medication failed to work. We ended up that one of us had to stay with Leroy all the time before we met Julia. 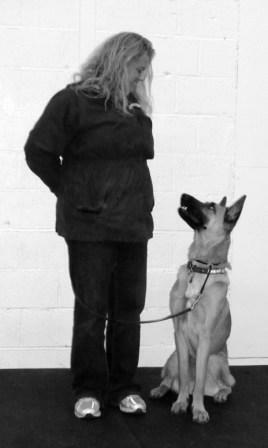 Julia had us create the first connections we had with Leroy through obedience training. Thank you Julia for helping us have a dog that can be left loose in the house and has more freedom because he is responsive to our wishes. Leroy thanks you too because he got to live. I don't think we could have gone on much longer the way were going before we met you. We were over our heads with Leroy's behavior and distressed further by even the consideration that we might put an otherwise healthy dog to sleep because of unsolved behavior issues. You gave us all the gift of training. Though to see Leroy now some might call it a miracle. 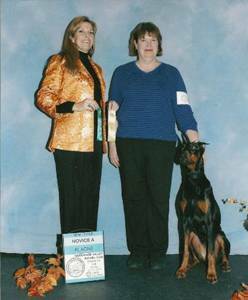 After adopting a twice-returned rescued Doberman, I was introduced to this trainer who would change my dog-owning life. Julia took my troublesome "she-devil" and turned her into the obedient dog who is the envy of the neighborhood. Not only did we develop the skills we need for everyday life, but also basics good enough for competing in the arena. Julia's training methods gave us the edge we needed to compete in AKC obedience and working dog as well as Schutzhund events. 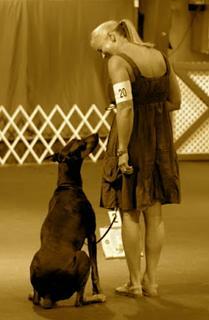 To mold a no-name dog to compete with the best and be a great companion, that's what I call a great trainer! We would recommend Julia McDonough’s training services to anyone with a dog – problem behaviors or not. 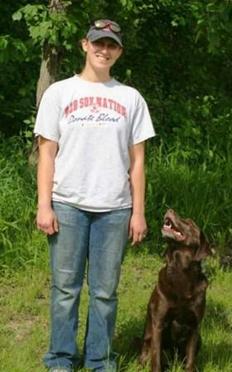 We sought Julia’s help to teach our 6 month German Shorthair Pointer how to walk on a loose leash. We now have a level of control on and off of the leash (for both our GSP and our Beagle) that we never thought possible. In addition, our home and our “pack” are now more balanced as a result of our training. Consider it an investment in your future; you will learn things you didn’t realize you needed to know. 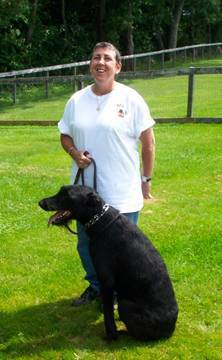 As the Training Director of Doberman Rescue Unlimited from 1998-2005, Julia McDonough was instrumental in the success of DRU’s most challenging residents. Her DRU University program was a holistic approach to the behavioral health of our dogs and outstanding educational outreach to our adopters. DRU University is a model for shelter training programs nationwide. She brought with her a real hands-on problem-solving mentality, a deep respect for our breed, and an ability to communicate with our most difficult human clients and associates. To this day, we still use her handling protocols for our staff and volunteers, and we look at our dogs and adopters the way she did: with their best potential in mind. 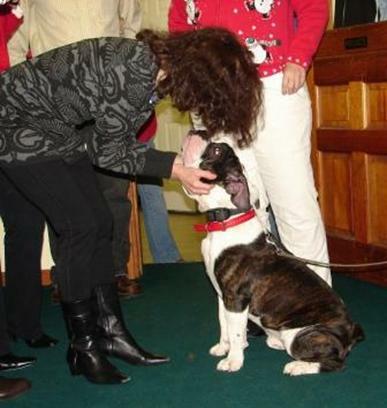 We know that during her tenure with us, Julia’s work saved adoptions, relationships and many dogs’ lives. We appreciate her service to our organization and wish her continued success. Dog owners should not hesitate to contact her for training, especially those interested in establishing a true positive relationship with their dog. On a recent dark night, my car got stuck in my 1/2 mile long driveway. After calling from the house, I brought my two German Shepherds with me to meet the man from AAA back at the car. 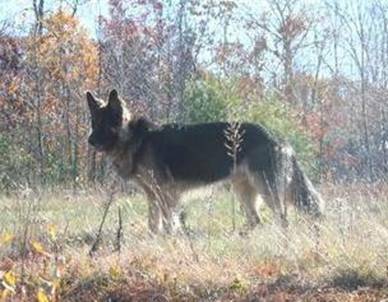 He had started walking towards the house and was standing in the pitch black when my 100 lb male, Hero, announced his presence. Julia had just taught me how to use the e-collar with Hero, who had never before been reliable with recall under distracting conditions. My big two year old GSD was barking and bounding around the AAA man, who was standing still as a stick there in the dark. I said 'he's okay' to Hero, and the man said 'thank God.' 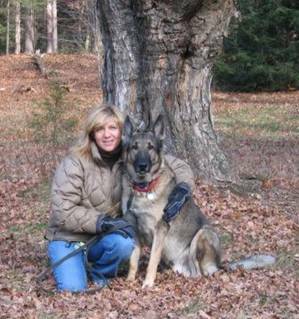 One call and Hero joined Suzie, my female GSD who was heeling on lead at my side. They both watched the stranger quietly as we continued walking back to the car. I've never felt safer than I did in the dark that night, and I've had GSDs much of my life. I've just never experienced the kind of control, communication, and partnership with my dogs that Julia showed me. Thank you, Julia. … Julia's method of training is very simple. I believe the easier it is for us to learn, the easier it will be for us to continue maintaining our dog’s behavior after our training is over. We love our dogs so it's rewarding to learn so much to help our dogs and be able to spend more time with them (because now we can bring them to public places with us.). We now have noticeable results we can maintain thanks to Julia. It's a huge relief to be able to control our dogs. We traveled 1 hour and 40 minutes for classes and will not hesitate to drop in to some advanced classes now to keep up our good work. Even with the long drive and high gas prices theses classes are worth everything we put into them. We own two Olde English Bulldogges that are both around 16 months of age. Great dogs but we had a difficult time walking them. They pulled, jumped, and were very obstinate. They would come only when they wanted to and feeding them was a nightmare. Our female was very dog aggressive and skittish. We researched MANY trainers that claimed they could "help". When we contacted a trainer we explained the situation and informed the trainers that our dogs are intact because of our plans to breed them together. This is where we ran into problems. We were told "no trainers will take your dogs if they are intact". "Intact dogs are impossible to train". Then we found Fortunate K9 (Julia McDonough and Rick Froton). Julia was great she set time aside to evaluate our dogs and the issues we were having. Julia also wanted to make sure we were 100 percent dedicated to the training. 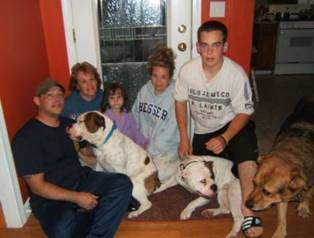 Our family is so happy and pleased with the service and dedication Julia and Rick have put into our dogs. They gave our dogs a better quality of life through better obedience. They still answer questions long after the "training" is over. 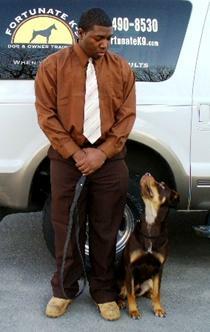 I would sum up Fortunate K9 as being Loyal, Dedicated, Friendly, Experienced and Professional. Before we met Julia, we applied training techniques that we had learned from professional dog trainers, our breeder and by reading Tamar Geller’s “The Loved Dog” and found we were coming up short. The advice helped form a foundation for training, but it wasn’t enough for Brody. In desperation I contacted the DRU for advice. I was convinced that I had a great dog but came to the conclusion that he needed more than we could handle. A few days later I found Julia and sent her a long email explaining our story. Soon after I sent my email, Julia called me. I’m sure she heard the panic and desperation in my email. After a long conversation on the phone, Julia was able to explain to me “why” Brody may be having behavioral issues and offered to meet with me. After 10 minutes of sitting quietly with Julia and Brody, I realized she had a handle on Brody. She was in charge. Brody was not. WOW. I signed up for 5 private lessons and it was the beginning of Brody’s new life. Julia is kind, patient and wants you to succeed. Never did I feel intimidated by her methods. She made training fun for all of us. Barley’s dog aggression was obvious the day we adopted him. We figured we could handle that issue, but soon after he settled in, he decided to show us that he didn’t care for humans either. His problems escalated from there. Even as a pup, our Aussie-X would attack any dog we met on a trail; even if that dog happened to be a Newfoundland, three times his size. We tried different muzzles, but quickly realized we couldn’t take him hiking or biking with those for fear he would overheat. Even after much ‘positive only’ training, we constantly dreaded the day we would have to put him down due to a serious bite. Thanks to Julia and company, we can now go into public with confidence that we’re in control and so is Barley. We’ve continued biking and hiking off leash and muzzle free with amazing success. He’s responded so well to Julia’s training techniques that we could not have asked for anything better! 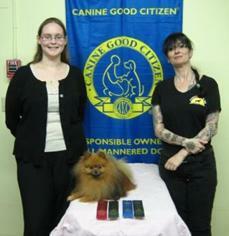 Here is a picture of Barley in the Sunday Group class. I want to thank you again for reforming Lenny from a pain in the neck to the wonderful pet that he is. I consider walking him in the park as the best time of my day (it used to be the most stressful hour of our day), and it’s the first time we all feel pride of ownership :) The energy in the house is so different; no shouting and no whining. He still grabs food when we turn our back, he just can’t help it when I bake. But it’s manageable, especially because we’re not angry at him all the time. Life is so much better now and we intend to keep it this way! Our story with Fortunate K9 starts back in March after returning home from a walk and feeling so frustrated that we would never be able to walk our Bulldog Bob in public again. He would get in his "reactive" mode and scream his little brains out at another dog on leash. After all our experiences with puppy kindergartens and related classes, we decided it was time for a real trainer. 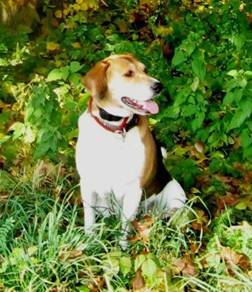 We were moving to Newburyport and wanted to be able to walk him with our lab in and around town. Julia trained us in the proper ways to handle him. We noticed an immediate change the first session. The change in him has been amazing and the insight she gave us about his behavior has been invaluable. We would whole heartedly recommend her to anyone looking for real results! Well - I'm so excited to say Kobi passed his CGC Test! I'm really just so proud of him and myself for coming this far in such a short amount of time especially w/the set backs we had in September, my confidence level just plummeted. I can say honestly that we owe it all to you and our training at Fortunate K9! If it weren't for your help and the Sunday group training classes helping to build that confidence back up, I'm not sure quite where we'd be right now...I cant even put into words what it means to us. 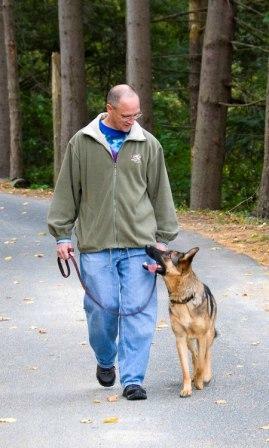 I'm attaching a photo of Kobi and I hiking at Maudsley State Park in Newburyport, MA, it was a great day for all! I look forward to many more happy accomplishments and achievements training with you and Fortunate K9 in the years ahead. Thanks again for ALL your support - we COULD NEVER have done this w/out you! Friends told us that adopting Nigel, a 4 year old male boxer was a big mistake. Twice returned to rescue because of serious dog aggression, his history was not promising, Worse, I have always been a bit afraid of dogs and this whirling dervish on the end of a leash was a terrible choice for my first dog. But how could we leave him in rescue when no one else would take him? My fist walk with him was a disaster. He bucked like a bronco at the end of the leash. I really thought that we might have to give him up. It would have meant that he was on his third strike at finding a home. We had the heart to help him, but not the skills. Luckily, a web search lead me to the Fortunate K9 website. In one evening I read every article that Julia had written. Here was exactly what we were looking for. Everything was clear and logical; well balanced and well written. I knew that these were people who could help Nigel and us. I believed her. We began training the very next day. Over the 5 weeks of training, the anxiety level in our house dropped significantly. Nigel relaxed. We relaxed. Walks got easier every day. 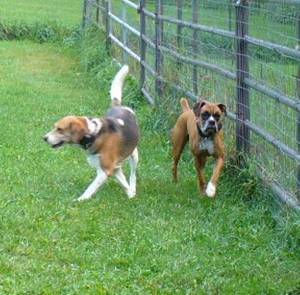 Even running into other dogs, which used to cause shoulder jarring battles, is no longer much of a problem. A few months later, we were even able to go away for our annual fall vacation knowing that by leaving our dog at FK9 his training would only be reinforced. We came back to an even calmer and more well behaved dog. The most amazing thing about the training has been learning to really respect our dog and at the same time be in control of him. I no longer think of Nigel as either an aggressive wild animal that needs an iron fist, nor a poor pitiful baby that needs rescuing, but a companion with whom I have a clear mutual understanding about privileges and responsibilities. We simply cannot recommend Fortunate K9 training highly enough. What they were able to do for us is nothing short of miraculous. Our dog may never romp in a dog park, but he’s a content and happy member of our family. Visit our News/Updates page for the latest class announcements and additional important information! Charlie and I want to thank everyone for our success yesterday! couldn't have one male visitor in my home without Charlie being crated. the Fortunate K9 training team. After bringing home our rescue dog, Addie, we were faced with an unexpected challenge. We had no idea that sweet and friendly Addie suffered from severe separation anxiety. In addition to her non-stop barking, we feared she could hurt herself in her panic when left alone. From our first lesson with Julia, we saw an immediate improvement in Addie’s behavior. Addie can now be safely left alone and she does not bark. She has great manners and is a pleasure both on and off leash. It is always nice when a stranger goes out of their way to compliment her good behavior. 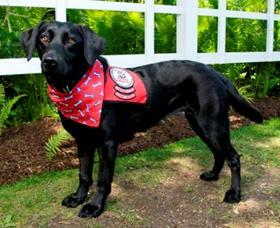 We are proud that Addie has received her Canine Good Citizen certification and is also a registered Therapy Dog. Just wanted to drop you a note now that we're all settled in WA. Things with Maya are going GREAT, she's been such a great dog and its so wonderful having the confidence to take her places...we put together a little video for you that shows you everything she would have missed out on this winter if we hadn't worked with you guys. Best decision we ever made. I only wish we'd done it sooner so that we could've had more time together. Anyway, the video has less obedience examples than I'd prefer, but Sean and I just now decided that we'd make up for that by doing seasonal videos for you guys. :) Mountain biking and hiking seasons are coming up and we'll be sure to get more "obedience in action" shots. But this gives you a feel for the life we can enjoy with Maya now that we have your great training to rely on. We're loving it! Maya has been great. Sean's parents came a-visiting this weekend and we had absolutely no issues! She used to have a "thing" for Sean's father...a "thing" as in she wanted to take a chunk out of his leg. By the end of the first night of their visit she was snuggling on the couch with him! So cute. We LOVE knowing how to communicate with Maya and she clearly loves knowing to look to us for guidance. She's blossoming. 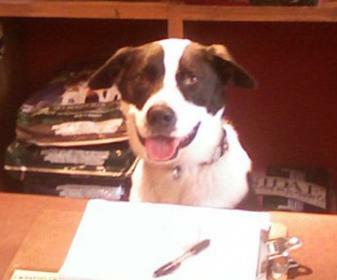 Before I came to Fortunate K9 my dog Roscoe was extremely dog aggressive. We had no control and we really had no obedience. We could barely even get him to sit. I liked what we got from Fortunate K9 because they taught not only the dog things he needs to know, they also taught us. When you train with them, you get not only a professional relationship but also a lot of friendship and support. I was nervous sending him away to Boarding School for 4 weeks as I knew I would have severe separation anxiety! 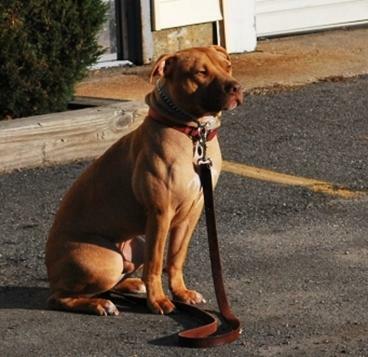 I shouldn’t have worried because he came back to me with all the obedience skills and in even better physical condition. He obviously had a good time and got plenty of exercise. After all we went through with Roscoe, who'd ever think we could get a CGC? But we did. And we continue training with Rick because we see so much progress every day. Nelson came to me 18 months ago from an Arkansas transport. I thought he was the perfect dog! But as time passed, he began acting out. It started with him barking at men as they walked by our house and progressed into having to hold him back from lunging at men as we walked past them on the street. I thought, “So, he doesn’t like men… we all have our hang-ups”. I was spending countless hours making excuses for his bad behavior. In early November of last year I was going out of town and Nelson spent a few nights at my parents’ house. That’s when I got The Call. Nelson bit someone! I hung up the phone, sat in a parking lot and cried. I had a 115lb Great Dane and no idea what to do. 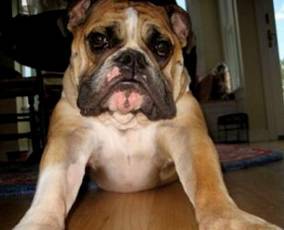 I needed to find a dog trainer that could help us – REALLY help us! I found Fortunate K9, read the website, made a desperate call and left a desperate message. Julia called me back right away. She talked with an overabundance of knowledge, not only about Nelson’s behavior, but also his breed, temperament, and potential. We started training soon after. Today, six months after I made that call, Nelson and I just got back from running in the "Rock N' Race" in Concord. 6,000 people showed up to run in the race! Nelson was perfect the whole time! When we first arrived we sat on the State House lawn waiting for the race to start. Nelson let people come up and pet him. The race started and it was CROWDED. Nelson stayed next to me and didn't leave my side. He didn't react to the men running next to us, the women jogging with strollers or the boys running behind us yelling and pushing each other. More important than him not reacting, he didn't seem nervous or worried. His tail was wagging and he seemed to be having a great time. Many thanks to Julia! Six months ago this would not have been possible. Nelson has really become the perfect dog! 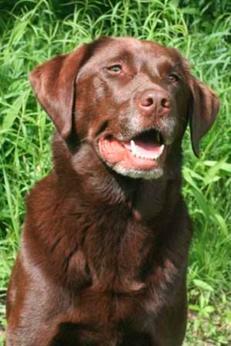 Despite the fact that I think she is the most wonderful dog in existence, my Hazel, a 4 year old Labrador Retriever, is just a regular dog. I hate to put it that way, but she really is. She is just what you would expect from a young Lab-happy, goofy, affectionate, and generally a friend of all people and creatures. 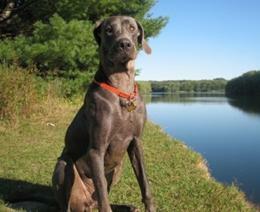 She had already earned her CGC before I began training with Fortunate K9 and has always been a pleasure to live with. What really made me get back into formal training was that Hazel had begun barking at other dogs while out on walks. When I began taking Hazel to private lessons with Julia, I began to realize that Julia could not only help us fix this problem, but that Hazel and I could really continue working as a team to enhance our ability to communicate. Julia quickly got us up to speed so that we could begin attending advanced group classes. I was amazed at the behavior of all of the other dogs in class and was even more impressed when I learned that so many of them had histories of aggression towards people and/or other dogs. I love when our class walks around downtown Derry. People just stare at us in amazement because we are out in a large group requiring our dogs to not only behave appropriately and respectfully, but also to execute commands while in the presence of a great many distractions. Training at Fortunate K9 has been such a learning experience for me. Julia and Rick are so knowledgeable and experienced that it seems like no problem is too tough for them. Though Julia and Rick are the trainers, I have also learned a great deal from being in classes with devoted dog owners who take training seriously. The successes of my classmates, many of whom have titled their dogs in Rally and Obedience, continue to motivate me to work with Hazel in preparation for when we will begin competing. Hazel and I are working together at a level I never imagined thanks to Julia’s training skills along with her constant encouragement. I have learned to employ training tools and methods that I had previously found intimidating due to the current climate in the world of dog training that purports that humane training is accomplished only through the use of food, clickers, and praise. 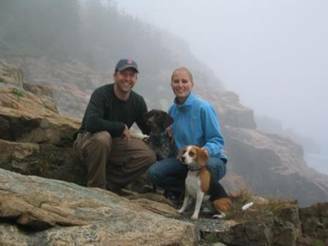 Julia and Rick use plenty of praise and food in their training but also know enough about the nature of dogs that they understand the need for a balanced, individualized approach to training. In essence, my dog has learned that she has to look to me for direction and that she is accountable for her choices. In turn, I have learned that what is truly fair and humane is to communicate with Hazel as clearly and concisely as possible. When I take my dog out in public, whether for a walk in our neighborhood, into a local store, or through a crowded park, people often comment on how well behaved she is. I am so proud of my Hazel and of the work that we have done together, and I cannot thank Julia enough for helping us to continue to set and achieve new goals. Fortunate K9’s tagline, “When You’re Ready for Results,” could not be more appropriate. Whether you have a dog with serious behavior problems or you just want to enhance your relationship with your dog through obedience training, Fortunate K9 is the place to go for the help you need. 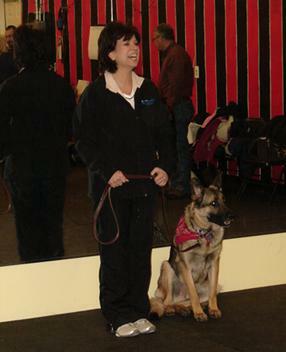 I started training with Julia approximately 10 years ago with my male German Shepherd and continue with my current dogs. I would recommend Fortunate K9 to anyone. The real life, common sense training methods work. One of the best parts of training is the “Field Trips” outside of the training center and on the sidewalks and other public areas of town. I have had experience with bad trainers and their gimmicks and quick fixes and appreciate the common sense and honesty Julia and Rick use in their methods. 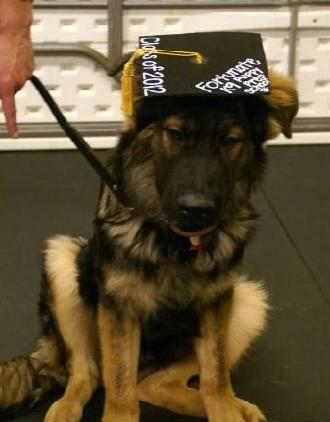 They and their students are supportive in whatever facet of training you want to pursue: Rally, Obedience, Schutzhund, Bird Hunting, it doesn’t matter. They will support you and help you reach your goals. My dog, Annabelle, has been reactive ever since I got her when she was about one year old. Generally tail-waggingly sweet and calm with humans both big and small, she nevertheless wanted to mangle my cats when she arrived and to intimidate anything, alive or inanimate, with which she was unfamiliar by charging straight at it, in a noisy display of threatening intent. But she has always reserved her greatest ferocity for other dogs, lunging at them with all the barks, growls, snarls and intensity that made her seem like a hundred pound attack dog, rather than the 32-pound three-legged dog that she is. She would never back down, and although most dogs gave way to her challenges, the possibility of an out-and-out fight has always terrified me. Not to mention the embarrassment in crossing paths with other dog owners. Sound familiar? Over the years, she has become fairly desensitized to the bikes, skateboards, funny hats, crutches, and the strange things folks carry. Yes, we did lots of work with trainers, both individually and in classes. The most helpful work we did was basic obedience and agility - this improved her responsiveness and trust in me, and we had some fun, too. However, every trainer failed to help me with her aggression, even those who were nationally known and claimed expertise, all using a "click and treat to calm" approach. I was even told that I might have to lower my expectations for any significant improvement. 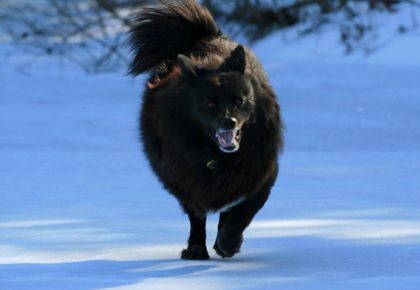 After a long hiatus, with Annabelle at 4 1/2 years, I decided to seriously search for a trainer that would be able to work with an aggressive dog with a spitz temperament. I chose to try the Fortunate K9 after reading a number of impressive articles written by Julia McDonough on this website, and after our initial evaluation with Rick Froton, I knew I had come to the right place. Our progress was immediate, as Rick explained that Annabelle needed solid and clear direction from me, and he gave me the tools to begin accomplishing this. From the beginning, I was able to achieve some measure of control with Annabelle, and with every individual session I learned how to further improve my handling, and Annabelle responded in proportion to my learning curve. A key goal has been to shape Annabelle's behavior so that she checks in with me before her aggression kicks in, enabling me to prevent or mitigate her response to other dogs. We have continued training with Rick in a group setting, where Annabelle is challenged with close and prolonged contact with other reactive dogs. Using various exercises, Rick gives immediate feedback with each new situation, helping me to read my dog. Rick emphasizes calmness and drawing out the behavior that we are working towards. And indeed, Annabelle's behavior is changing, shifting from challenge to compliance, and sometimes, even relaxation. Her level of intensity is declining, and her trust in me to handle real world situations has deepened. Our work will continue for a while, as there are years of set behavior to alter. I have complete faith in Rick, and feel 'fortunate' to have found him. Oh, and he's a great guy! The testimonials and photos on this page represent a small sample of many satisfied Fortunate K9 clients, whose dogs populate the entire spectrum of behavior. From human-aggressive dogs and serious dog fighters to well adjusted family pets whose owners desired more freedom for them, you’re sure to see a story which reminds you of your own. These owners all have one thing in common; they were committed to working with their dogs and dedicated to creating a better relationship between canine and human. All of these testimonials were sent to us weeks, months and in several cases, years after training with us, reminding us that good training has a lasting effect. And none of them are the result of a hastily completed form given to a student before he leaves on his last lesson or after the first lesson as with many trainers. A testimonial matters more when it arrives in our in-box well after the training sessions have been completed. 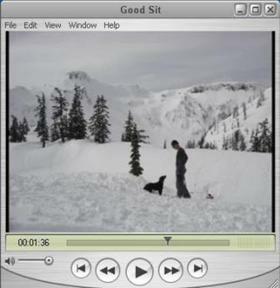 Or in the case of Maya the Dog, when a video arrives months after the training and from all the way across the country. We have always believed that we were fortunate to have the best students and nothing has changed our opinion on that point over the years. We look forward to adding your testimonial and photo someday. REAL TESTIMONIALS - REAL TRAINING - REAL RESULTS! Long before I got my puppy I planned to train with Fortunate K9. Having had puppies before and a difficult adulthood with a fear aggressive dog I realized I wanted to make this relationship count. After witnessing two GSD’s walking free in the pet store responding to voice commands I was sold on FK9 after finding out who the owners trained with. 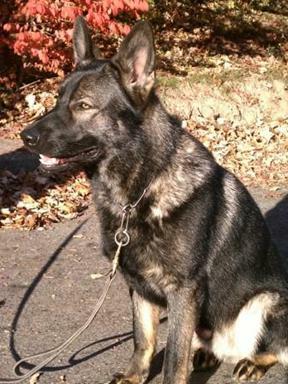 A year later I purchased, (I prefer using the word adopted), a GSD puppy from Munster Abbey Kennel in Maine. Too much cuddling, playing and affection oozed from me to her. I made all the mistakes I could, leaving me and the dog in the category of littermates. As she grew she became brattier with me. I was bruised from her nipping my thighs. The men in my family would be rewarded with her respect and I was given the paw. I cried weekly, desperately wanting a working dog that I might be able to do therapy with. Although I attended puppy class with Julia we needed to do some individual work. I was worried that we were repeating the same commands in our classes as we did in pup school. Now I realize my dog was a different beast having grown to a year old. Although the commands were the same, the methods would be different to teach my adolescent how to respect her “Mom” with the same goals in mind. Today I volunteer at FK9 to support their business. I don’t do this just for support of my dog training. I do this because every dog should be trained, well, by this outfit. Julia demonstrated knowledge that has connected me to Siren in a way I have never been connected to a dog before. Now, at home, the men in my family look to me to get results from Si, where they have lost their voices. The bond we have developed by discipline and training is deeper than any bond we could get from my free affection. My German Shepherd can now be off leash in my yard with supervision and responds only to my voice. This is magic. This was my goal. My goals continue to evolve. Siren looks to be a candidate for some kind of therapy work and I will explore that as well as Rally competition. The bond with FK9 has been a healthy, supportive, teaching connection that I would recommend to anyone who is looking to get RESULTS. Boarding School student Gus, an 11 month old intact Olde English Bulldogge, being the life of the party at the Fortunate K9 Christmas party. Our Boarding School dogs are exposed to real life as often as possible. The goal is control under all of life’s distractions. Including extremely friendly strangers like our student Marcia! Having the NEW Maggie around brings back fond memories of our Lab (Holly) and (Betty Lou) our Shepherd. We've been blessed with wonderful family members and now Maggie Mae brings much joy and happiness into our home thanks to you. We send our most sincere gratitude and thanks to a very special person. Rick with boarding student Maggie. Maggie's aggression was deep, forward moving and very real. She was much more than just a little “reactive”. After my GSD passed away I knew I wanted another dog, but what? I consider myself a responsible pet owner and was asking all the questions everyone should be asking themselves before bring a dog home. Male/female, breed/mix breed, age, energy level, breeder, rescue, shelter, this was going to take a lot of time and thought as it should. During this transition period, I heard of a small dog rescue, ARNNE, that was looking for volunteers. Great, I’ll walk dogs, sharpen up my training skills and fill a void in my life while help out some needy dogs. Shortly thereafter I got an email from ARNNE about a dog that was being returned to the shelter. He had been in doggie boot camp. The “professional trainer” had given up on him. “Brock” was a 10 month old, male pit mix that had been surrendered with 3 other male pits from the same home almost 4 months earlier. He appeared to be a very happy, wiggling puppy, unfortunately with NO training, a little hyper and excitable. 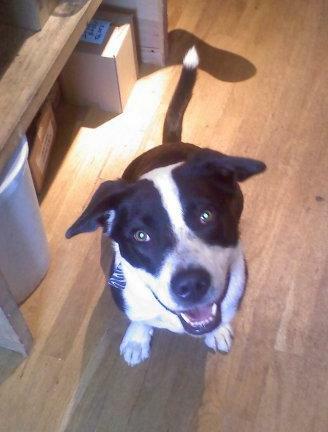 Inquiring more about his background I was informed he was great with people but should never be with other dogs. Why??? He came to the shelter as a pup that liked both people and dogs. Unfortunately his larger sibling has some dog aggression issues and he had been forced to defend himself. After several confrontations with his brother he was done with other dogs. The “professional trainer” suggested they both be euthanized. I decide to foster Brock and try to train him a bit to improve his chances of adoption. ARNNE suggested I take him to Rick at Fortunate K9. I had taken AKC classes & done protection work with my Rottweiler, clicker training with my GSD, but I’ve always worked with my own dogs starting with young puppies. For the sake of Brock finding a good home I agreed to classes with Rick (who was evaluating and training Brock’s brother Simba). Move over Cesar, there is another dog whisperer. Without a doubt this was the most enjoyable and educational class I’ve taken. Rick has a very logical and realistic approach to training. He takes the time to answer ALL questions. Group sessions are great at keeping your animal focused on you. You have to do your homework; there is no magic fairy dust. 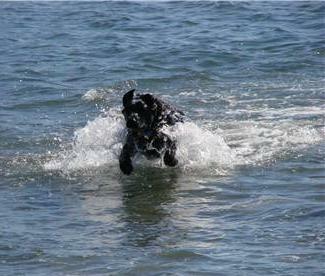 With Fortunate K9’s techniques and guidance you will be amazed at how easy and enjoyable training can be. 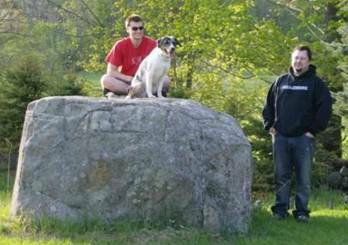 The dogs and owners that work with Rick truly are Fortunate to have found him. Brock the little hardhead with A.D.D. did find a home. He learned quickly and showed no aggression towards any dogs in group sessions. He became such a joy and so eager to please that I adopted him. Brock is my first shelter/rescue dog. We will continue classes with Rick. I know I’ll never have a dog park dog, but I have high hopes Rick can teach me to rebuild his confidence and maybe he can have a sister someday. dogs need people and boundaries, people need Fortunate K9. 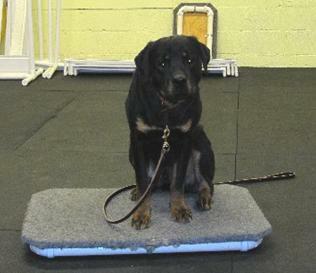 Brock performing a long sit/stay during the Obedience 101 class. Brock is a rescue from www.ARNNE.org . Although another dog professional recommended that both he and his brother Simba be euthanized for fighting each other, more experienced heads prevailed. After all, male adolescent pitbull littermates having “issues” with each other should be no surprise. Today, Brock thrives with a sensible and dedicated owner. Hope you are enjoying the new year. Some friends of ours just sent us an email that they are going to begin training with you, so I thought I would send you a little update on how our pups are doing. 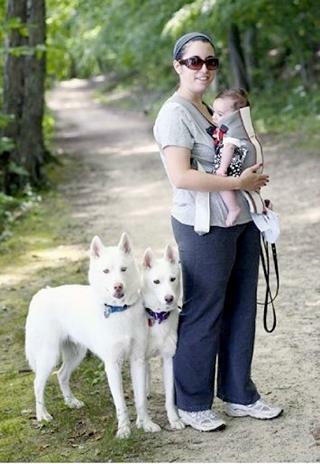 Reilly and Dakota (white Siberian Husky twins) welcomed their human brother, Jack, on June 24th of last year. While we had been very nervous about how our new pack member would be welcomed, our homecoming went off without a hitch. From the first day, Reilly was captivated with the baby, following him from room to room and carefully watching anyone other than mom or dad that dared to hold his baby. He was on constant diaper watch and alerted us immediately if Jack went potty. If Jack cried for more than a minute, Reilly was right there to wake us up and alert us that we should get up and tend to him. Now that Jack is almost 7 months old, both dogs find him to be more interesting. I watched in terror as Jack reached out to pet Dakota and clamped his little fist down on her nose and mouth. Dakota took it in stride without blinking an eye. Jack has not mastered "gentle petting" yet, although we work on it every day, and the dogs are patient with him. The most important thing that you gave us was the ability to for me to walk all three of them happily. With their training collars on, in proper heel position, I spent the majority of my summer walking the dogs alongside the stroller two or three times daily. The dogs, while not perfect, will now patiently and properly sit at my heel while we stop to show off the baby to neighbors. While I didn't believe you when you told me it happened to you, we have had many instances now when total strangers have pulled over their cars to compliment the dogs walking and tell me how striking they are. Had we not chosen to train with you, my summer could have easily been a nightmare, not being able to take the dogs out with the baby. I am now staying home with the baby, so even though our pack has grown, my dogs no longer spend much time alone. While we continue to be diligent in protecting our son from the unpredictability of any dog, it gets easier every day. Yesterday, at the onset of our walk, we stopped to chat with my next door neighbor. After chatting for ten minutes, I had almost forgotten that the dogs were there. I glanced down and they were both sitting and patiently waiting for me to stop chatting so our walk could commence, and I thought of you and Rick and smiled. Hope all is well. We are certainly grateful for all you've given us. Where do I begin? Well, our boy came to us like an illegitimate child...unexpected. As a young couple, we certainly were not prepared for a full-time dog commitment. We weren't ready to give up our freedom; however, we loved Jackson ...there was no way I was going to make my mother take him back or bring him to a shelter...he was ours now and we made a point to take the best care of him, no matter what! To make a long story short: Jackson's package included: Unconditional love, Handsomeness and Humor w/ some serious sides of Separation Anxiety, Dog Reactivity and Aggression towards Humans. Furthermore, by the suggestion of my mother, we took him to a behaviorist at Angell Memorial in Boston, MA. The Doctor sat with me, my mom and Jackson for 5 hours with the end result being prescriptions written for Prozac and Xanax (for the dog) and one written for me (as the owner) to "grow a pair." Hmm, well...let's just say that when I called 3 months later to make a follow-up appointment, the doctor "no longer worked here" and had "relocated" to Maryland. ALERT!! We had been conned. :o( Now we were left not only with our puppy Jackson still anxious and fearful but also drugged up and unable to enjoy the basic normality of a happy canine's life. So, on to the next step...a trainer who called herself a "witch." NEXT PLEASE!! Behaviorist #2 - Upped the Prozac and Xanax - Jackson was catatonic and began having seizures, his separation anxiety was so horrible, he had the cops called on him for barking 5 hours non-stop. 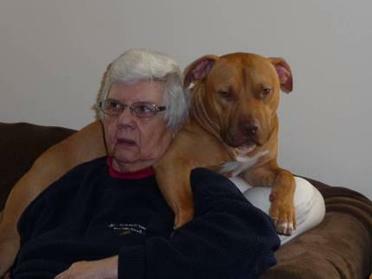 The behaviorist said there was "nothing she could do." Justin and I were lost, fighting and frustrated we had nowhere to turn, we were discouraged and even getting to the point of breaking up. I was $3,000 in debt because of vet bills, Jackson wasn't any better behaved and now he was epileptic from the medicine he was on. What the heck were we going to do next? There was no way we were going to give up on Jackson, he was our responsibility and we knew he had the potential to be an outstanding pet and companion. He was part of our "unit" now. So with the little hope I had left for him, I Googled for an answer. His new package included: Unconditional love, Handsomeness, Humor, Attention, Obedience and Medication-Free. End result: Justin and I became responsible dog owners who had control over Jackson rather than him controlling us. Jackson is ultimately happy with life now. Although he still has his moments, being able to look at him and not see the confused pain in his eyes from the prior attempts is truly a miracle in itself. We cannot thank Julia and Fortunate K9 enough for all they have given to us and to Jackson. If you think you’re at the end of your rope with a hopeless case, please give the Fortunate K9 Team a chance! You will not regret it. Brock cuddles with Sandy’s mom. This is one of his favorite positions. To see them all visit our Face Book page. In a world where only 1 out of every 600 pitbulls finds a home, every pitbull needs to be a breed ambassador.The negative portrait of the bully breeds painted by the media and fed by ignorant owners that exploit this but loyal breed is hard to fight, but the best chance to do it is with great examples of the dogs themselves. 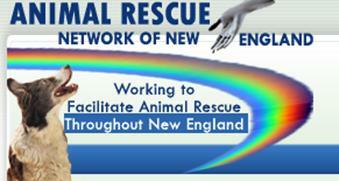 At the shelter supported by Animal Rescue Network of New England, Inc, where pit bulls are unclaimed or abandoned, we are faced with placing this smart, strong and loyal breed into responsible adopters' hands. Rick at Fortunate K9 has taught our handlers the skills to train the dogs in our care, pitties and non-pitties alike, to have solid obedience and manners to be good representatives of shelter dogs. The training sessions are well presented, demonstrated and practiced in a safe and comfortable environment. Clear and concise handouts are given at the end of every class to reinforce and review class work and to make it easier to practice techniques at home. 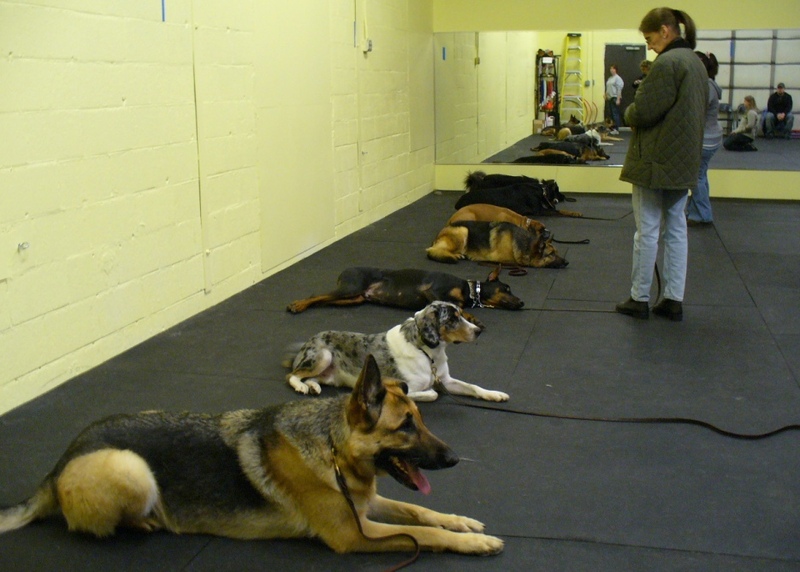 Once basic obedience class is complete, weekly drop in classes are available to continue training in an even more challenging environment to test for obedience in the 'real" world. Rick has shown his dedication to the animals in need and has gone above and beyond by personally boarding and training one such abandoned dog, Simba, a Dogue De Bordeaux/Pit mix, who could no longer handle shelter life. The look on his face tore at our hearts because we knew that his future looked dim until he won Rick's heart and challenged his training experience. Now Simba will soon be a star in Rick's FK9 Pitbull Drill team, a testament to what is possible with the dedication and the training skills to make it happen. For more information of dogs waiting for forever homes, please visit www.ARRNE.org. This is a recommendation that is well overdue. I wanted to express my appreciation for Fortunate K9’s professional training techniques and the time and patience with our German Shepherd, Dakotah. Tom displayed excellent control and utilized his wealth of knowledge in showing us how to transform Dakotah, with his issues, into a well behaved dog. Tom did not hesitate to spend more time than necessary and we appreciate that. He takes his responsibilities very seriously. I would highly recommend Fortunate K9 to other individuals that are looking to train their dogs with a successful expediential outcome. Thanks again Tom for all your hard work and dedication! Thank you so much for all your hard work. My daughters were so afraid that if Yogi became really trained it would break his spirit but it's quite the opposite. He is still such a mushy goof ball but a well behaved mushy goofball! I will try to make as many drop-in classes as I can. I really enjoyed it and I think Yogi did too! Diane and Dakotah are all smiles in the Saturday Middle School drop-in class. Yogi practicing on his “place” board and Yogi practicing his down/stay with his housemate Eleanor. I just wanted to drop you a quick line to tell you about my adventures with Eli. This past weekend I thought I would take him for a walk around downtown Newburyport. I thought I would pick a quiet time for his first outing "downtown". When we arrived there was a fall harvest festival going on complete with street vendors, a stage for the band, food booths, a ton of people and plenty of dogs. Also plenty of ghosts, witches, and other weird creatures hanging from every pole. I was all set to turn around but I took a deep breath and figured what the heck. We ventured out into the crowd and Eli was absolutely perfect. The whole time nothing phased him at all. He just walked past everything as if it was just him and me. I had him right by my side as we walked around, and he sat patiently while I ate. 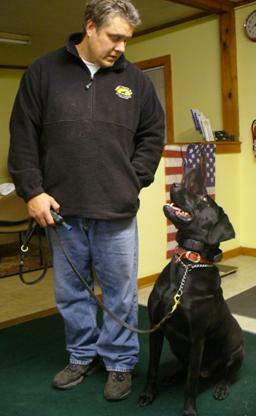 All in all we both had a great time and I just wanted to say thanks for all the training we received at Fortunate K9. We are hoping to stop over soon to attend one of the drop in classes. Not sure if you remember me telling you we were going to NY to visit my in-laws, and about my mother-in-laws nasty little Jack/Chi mix. Anyway, I'm very happy to report that Apollo was *amazing*! He was perfectly behaved around my MIL's dog- even when her dog was aggressive (growling, showing teeth) towards him. Apollo just ignored it and stayed with me (he was really looking at me for directions- lots of eye contact!). He did do the "flag tail" the first few minutes on the first day, but I redirected him a little and he relaxed. I had Apollo off leash, too- I was pretty confident in our training ;). He was seriously perfect for 5 full days there, and he put up with a lot. Chance was a wonderful puppy until a switch flipped or something around 1.5 years old. He's actually more reactive then aggressive, both with people and especially with dogs. That was embarrassing, but the worst part was I couldn't handle him without risking getting bit. It wasn't uncommon to simply pick him up or put him down and walk away with puncture wounds. I fended off threats to his life from family that told me things like "if he bites me, I will get my gun and shoot him" to others that told me no intact male would make a good pet and that I had to fix him. Since he was supposed to be my show dog, I refused to accept that and I didn't believe it anyway. An intact male sure can make a good dog. And the threats really hurt me. I bounced from the vet who said there was nothing medically wrong with him to a behaviorist that didn't do much but did plant the idea that I needed to find something to keep his mind busy. So I was checking the pet section on craigslist one day and found an ad for Fortunate K9. And here we are today, 2 years later, getting ribbons in competition. No more puncture wounds (although nail clipping is still a work in progress) and we can trust each other. Outbursts still happen, but hardly, and they never last long now. And we're still striving for better every day. Fortunate K9 has been our saving grace, and we've never had so much fun. I ask Chance if he wants to go to training and he bounces off the walls with excitement. This success means so much more because of where we started. THANK YOU to all of you at Fortunate K9! 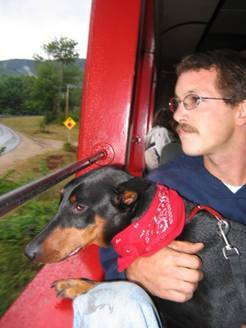 I have a 6 year old doberman, Ace, and we have been training for a year or so at Fortunate K9 in Derry, NH. During that time, we have gotten our Canine Good Citizen, Therapy Dog International Title, Obedience Rally Novice Title ( 3 straight blue ribbons!) and are currently working on our Obedience Rally Advanced Title. I take Ace to the VA Hospital in Manchester every two weeks for a "Therapy Visit" to the patients, and I can't tell you how much Ace and the patients (and Staff) LOVE it. My story is not unique among FK9 students. I credit my success to Fortunate K9. The staff is truly dedicated to real world results training. They are dedicated, enthusiastic and help us to reach goals, no matter how big or small. Just thought we would drop a note to show our appreciation for all the great teachings and training Fortunate K9 has provided us and our canines which has undoubtedly made us better dog owners and German Shepherds Marley, Sophie and Yeager better dogs. Not to mention how much more pleasurable and fun it is to be with the dogs in any venue. We had always had Golden Retrievers and although they had been taught the basics sit, down and stay we had never been exposed to real dog training or real trained dogs and therefore the Golden’s abilities were what one would expect from a typical “pet owner”, the Goldens were more like friendly pieces of furniture. You may be wondering why we now own German Shepherds, well in Oct 2009 there was a violent home invasion a half hour or so from where we live and because I was away a lot of the time with work Karen didn’t feel safe with two Goldens that could qualify for Walmart greeters, so after some quick research and debating she wanted a GSD and four days after the home invasion we got Marley, with one stipulation, that he be professionally trained. Oh brother, “professional training” what does that even mean?! We were in a big box pet supply store and noticed a training info center and we signed up. We put Marley through their “puppy, intermediate and advanced” classes and we worked with him almost daily practicing the techniques we were taught. 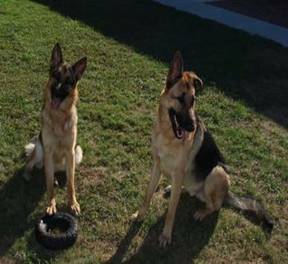 Although I would not recommend the retail training to anyone knowing all we know now we were blessed because at that time the trainer had thirty years experience dog training and raised GSD’s. Unfortunately now they hire inexperienced people and put them through their own corporate “training” program. Not to mention they are really limited in what they can provide because of the venue and corporate policy. After all that there was something missing, “attention”, we could not get any consistent attention from Marley and now that we had the training bug and realized the potential in this dog we were both dumbfounded as to what to do next, do we just keep doing the basics forever? So I started searching the internet and low and behold came across Fortunate K9, we read the info on the site and read the testimonials and decided this was perfect for us and Marley. We called and setup an appointment for an evaluation and soon we were on our way to “attention” with private classes. Amazing, some simple techniques which were easy to work on at home and success, we had attention and lots of it! Since coming to FK9 in Spring of 2010 we now have 4 GSD’s Marley CGC & Therapy dog, Sophie currently in PSA training and Yeager CGC and on his way to therapy. The youngest Sidney will start Puppy Training soon. We can’t express adequately enough the gratitude we have for Rick, Julia and Tom for all you have done for us. FK9 is tops when it comes to training, professionalism, compassion and services, not to mention the value. PS. Today Karen was out with Sophie and took her into one of the pet supply stores, while there, a dog fight broke out in the front of the store. Karen, seeing that Sophie was getting overly excited, quickly moved her to a vacant aisle and immediately put her in a “down” and kept her attention until the fight stopped. Shortly afterward a shepherd mix and owner came around the corner and the man allowed his dog to lunge at Karen and Sophie, Sophie growled but held her down, Karen asked the guy to keep his dog away from Sophie, he said “maybe you should not have your dog in public” Karen replied my dog is under control. Employees rushed over and escorted him out of the store, wasn’t surprising his dog started the fight at the front of the store.